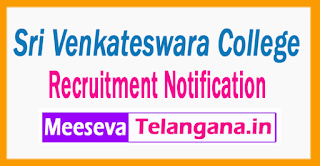 Sri Venkateswara College (SVC) Has Invited Application Form For 76 Assistant Professor . All Eligible Candidates Are Required To check Eligibility details for SVC Job Advertisement and Apply Online Before Or On 08-07-2017. 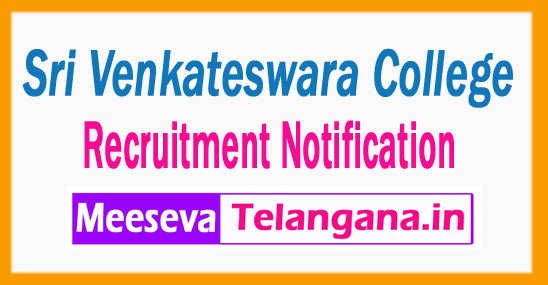 All Candidates Who Are Applying For SVC Recruitment 2017 - 76 Assistant Professor , Should Check Vacancy Details Like - Educational Qualifications And Experiences Requirement, Exam Pattern, Syllabus, Age Limit, Selection Criteria, Admit Card, Results, Exam Date, Before Applying. INR Rs. 15,600 - 39,100/- With 6000/- Grade Pay. All Eligible & Interested candidates may fill the online application through official website (http://svc.ac.in).before 08-07-2017. Last Date for Registration of Online Application Form Is -08-07-2017.